In the late 1960s a small group in CSIRO Plant Industry running experiments aimed at increasing the efficiency of grazing systems turned increasingly to computer modelling of these systems as a way of integrating research results and testing the extrapolation of management principles to other sites. A simple model of part of a grazing system, published in 1970, was developed by 1978 into a large model for optimising the management of a commercial grazing enterprise. The significance of this work, led by Michael Freer, is that it has enabled the results of a large mass of experimental work on the physiology and nutrition of ruminants to be applied by graziers to the complex problems of managing the nutrition of grazing animals. The GrazFeed program provides an interface between the user’s fairly simple descriptions of the pasture and grazing animals and the program’s assessment of the production that can be achieved and the extent to which a target can be met through supplementary feeding. The program is widely used by graziers and their advisers throughout temperate Australia and an assessment by the Centre for International Economics estimated its benefits to the industry at $300 million. This represents a return of $70 for each dollar spent on the development of the tool. In 2003 Michael Freer was awarded a CSIRO Lifetime Achievement award for his contributions to this field. The grazing industry makes a major contribution to Australia’s GDP and export income but it is an industry in which it has been difficult to realise the potential benefits that might be expected from the scientific research that has been done on components of the grazing system. On the other hand, it is an industry that desperately needs these benefits if it is to survive the problems caused by the highly-variable Australian climate and ever-worsening terms of trade. Australia has been at the forefront of the huge advances that have been made over the last 60 years in our understanding of the factors that affect the intake of food and its digestion and metabolism by ruminants and their energy and protein requirements. The main obstacle to the practical application of this work has been the difficulty of predicting the quantity and quality of the diet selected by the grazing animal from a feed base that is almost continuously variable. Without this information, the grazier has no way of estimating the extent to which the available feed will meet the animals’ requirements and whether supplementation is likely to be of economic benefit. At that time the program ran on a main-frame computer, so the testing of individual biological modules was cumbersome. When the module that simulated feed intake and animal productivity was extracted for development, it soon became obvious that it could have an independent role as a tactical tool for nutritional management. A paper advocating its use as a practical way of enabling graziers to apply feeding standards to grazing animals was presented in 1983. Feeding standards for ruminants in those days were based on overseas recommendations that were designed primarily for housed animals. In 1980, the Standing Committee on Agriculture initiated the development of a uniform system for Australian livestock and Freer was a member of the subcommittee that dealt with ruminants. Modifications to the Plant Industry animal model occurred alongside the development of the new standards so that it became a simple way of implementing the new recommendations on energy and protein requirements and the prediction of feed intake. Meanwhile, in 1985, CSIRO Plant Industry decided that the research models of grazing systems should be developed for commercial use in the grazing industry as the GRAZPLAN suite of decision support (DS) tools. John Donnelly was the leader of the project, Andrew Moore supervised the coding of the programs and Freer was responsible for the development of the animal model. GrazFeed, the first of these DS tools to be released, has the animal model at its core and was designed to enable users to assess the animal production obtainable from a pasture and the response to supplementation. The same code, when combined with soil moisture and plant growth modules provides the biological basis for the DS tools GrassGro and AusFarm that are designed for the long-term assessment of risk and optimisation in grazing enterprises. The first version of GrazFeed and the report of the feeding standards subcommittee were released in July 1990. Because the GRAZPLAN project was developer-driven rather than consumer-driven, a market had to be established and a marketing procedure organized for the DS tools. It was always expected that the main users would be advisers servicing the grazing industry in temperate Australia, with a secondary market in teaching institutions and a slowly developing market among graziers themselves. An official agreement was reached in 1985 on collaboration with NSW Agriculture for the testing and use of the DS tools, starting with GrazFeed and this was remarkably effective, largely through the continuing enthusiasm of a few individuals in the department, in particular Alan Bell and Phil Graham. Up to the time when the potential role of GrazFeed was first discussed with NSW Agriculture, very few of its advisory staff had any reason to become skilled in the quantitative assessment of herbage mass and digestibility, essential inputs for GrazFeed. The development of these skills was the main aim of the Pasture and Animal Assessment Project (PAAP) that was set up by Alan Bell and Ken Archer (also in the NSW department) and ran for 3 years at more than a dozen sites round NSW. The PAAP was accompanied by GrazFeed training workshops run by the CSIRO group and was followed by the PROGRAZE project, a training course for graziers in pasture assessment skills and their application in the nutritional management of grazing animals, using GrazFeed as the main DS tool. By early 1997, nearly 4 000 graziers had been through the courses, which were extended to the other southern states. The second phase of PROGRAZE took in another 5 000 graziers over a 4-year period. In 1989, CSIRO signed a contract with a company based in Sydney (Horizon Agriculture Pty Ltd) for the distribution of GRAZPLAN software. CSIRO retains the copyright on the computer code and Horizon Agriculture has the sole rights to market the compiled programs, from which CSIRO receives a royalty. The first commercial version of GrazFeed was released as an MS-DOS program, with a Windows® version following in 1998. The program is continually updated, with new information either from research or feed-back from users and also additional facilities. The latest version (5.0.1) includes a facility for the formulation of least-cost rations for the supplementation of grazing animals. As each new version of GrazFeed is released, the full specification of the model, first published in 1997, is updated in a Technical Paper published on our Plant Industry website. Also updated are a number of spreadsheet programs that allow users to test and explore the functions that are used in the model. More than 1 500 copies of GrazFeed have been distributed, many to advisers with a large number of clients. Up to 1994-95 when the PROGRAZE project started, sales to graziers made up only 13% of the total; since then this category has made up more than half the sales. In conversations with graziers, one now finds, to a quite wide-spread extent, a quantitative approach to their pastures and animals that was not present before the introduction of GrazFeed. 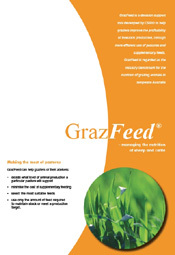 Quite apart from its direct use in the field, GrazFeed has been a potent tool for the testing and revision of the original nutritional recommendations on which it was based. Our own testing and the experience of individual users have revealed a number of weaknesses in these recommendations. Progressively, changes have been made to GrazFeed to increase the accuracy of its estimates and now, in turn, these changes have been incorporated in a revised edition of the original report, which has been published as ‘Nutrient Requirements of Domesticated Ruminants’. Freer M, 2009, Personal communication.